Resident Evil is pretty damn spooky, and the sparse sound design is a big part of it. The silence is eerie and unnatural. When you hear a sound somewhere, you just know it’s something bad. There’s no other possibility. Without a lot ambient noise to distract you, the clicking of the Licker’s claws against the tile floor in the room around the corner becomes your whole world. Through the sound design, the game highlights what you fear the most. It’s very effective, but at the same time, it’s very much a video game kind of fear. 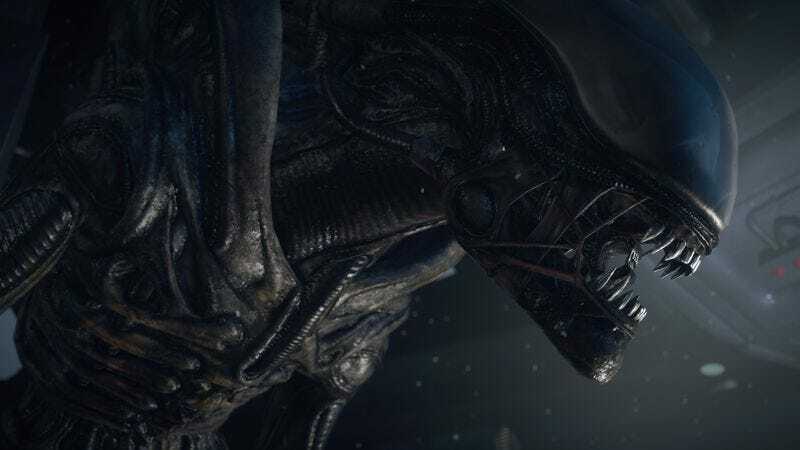 In Alien: Isolation, the developers take the game in a different direction. They’re trying to tap into a more primal kind of fear. The sound design is part of that. When you’re in a situation in real life where you’re really actually afraid and are expecting something unexpected or awful to happen at any time, your senses sharpen. You can hear everything around you. But the enhanced senses don’t help. There’s too much information. It’s cacophonous, disorienting. I think that’s what they were going for with this game. Resident Evil might give you thrills and chills, but Alien: Isolation hits you right in your lizard brain. I think Anthony may be onto something about unnatural silence being off-putting. And not just for letting feelings of dread percolate. I think the “uncanny valley” phenomenon can happen with slightly unnatural silence as well. Resident Evil‘s unnatural aural tics can trigger that. Exhibit A: Look at the real-life example of the “world’s quietest room” in Orfield Laboratories. The creators challenge visitors to simply exist in the room for more than 20 minutes, but it drives people batty. I always felt bad for the kids at the prom that weren’t in on the Carrie-humiliating scheme. They have no idea what’s going on, they just saw some girl get goop dumped on her and thought it was funny, and now they’re being massacred for no reason. Those poor saps. Actually, one night when I couldn’t sleep I started writing a song from that exact perspective, of a person who’s desperately trying to escape the carnage and is completely bewildered about what’s happening. I should try and finish it one of these days. The Library Of Congress has really made an impressive effort with their video game archival work. They’re constantly holding panels and summits on the subject, even if they don’t have a whole lot to show for it yet. The LOC is an organization that moves slowly, so major kudos to them for getting the ball rolling now. It’s quite a struggle to get any sort of headway into adding video games to library collections, especially as objects of study. At the academic library that I work for, we have a little less than 60 titles, most of which have been donated. (And some of the donations are…less than stellar examples of the medium. Oh thanks, a copy of Rise Of The Silver Surfer for the Wii.) They’re mostly viewed as recreational activities for students. That perception has a lot to do with some reluctance to view them as anything but time-wasters from the academic institution as a whole. There is, after all, little impetus to collect things that don’t support the curriculum or the research of professors. But, I would argue and have argued, that it’s a Catch-22: People don’t ask libraries to collect video games because they don’t view libraries as in the business of collecting video games. It’s hard to change that perception, but at the least LOC is making some headway. First, there’s the Lone Survivor soundtrack by Jasper Byrne. The game itself is a highly personal affair: a somewhat opaque but extremely atmospheric survival-horror game that is (like most of the best work in the genre) as much about loneliness as it is about horror. If you have not played it, you might still know Byrne from his work for Hotline Miami. The whole soundtrack is great. There are a lot more horrific songs than the title track (some of them tap into that weird Angelo Badalamenti vibe), but the title theme is great and worth listening to regardless. You can find it here, or better yet, check out the whole soundtrack on Bandcamp. My second vote would be for Daniel Olsén’s work on Year Walk. I have expressed my love for this game before. Simogo, the developer, basically knock it out of the park with the soundtrack for all their games. (Who has played Device 6 and doesn’t remember that song?) The Year Walk soundtrack hovers in an undefined area between spooky synth sounds, ghostly vocals, and Scandinavian folk music. Again, it’s perfect for the game, but also nice to listen to when you’re alone in the dark. Try “Locksång” or the scene setting title track. That’s it and that’s all, folks. Thanks for reading and commenting. We’ll see you again next week. Happy Halloween!